I think I know why we don’t hear much about sky driving these days. Did people really call Canadian Club “C. C.” back then? Do they now? “So long as you don’t get a puncture… sky driving over Fraser Canyon, British Columbia, in a balloon mobile is a great way to travel. No traffic jams. No speed limits. No detours. Only the treacherous mountain current… which we luckily avoided. “After we landed, disaster struck. Thump… thump… thump! A blowout on a lonely, wilderness road. And ‘Captain’ Jon Simmonds of the good ship ‘Baloon’ was just another earthbound driver… wrestling with a spare tire. 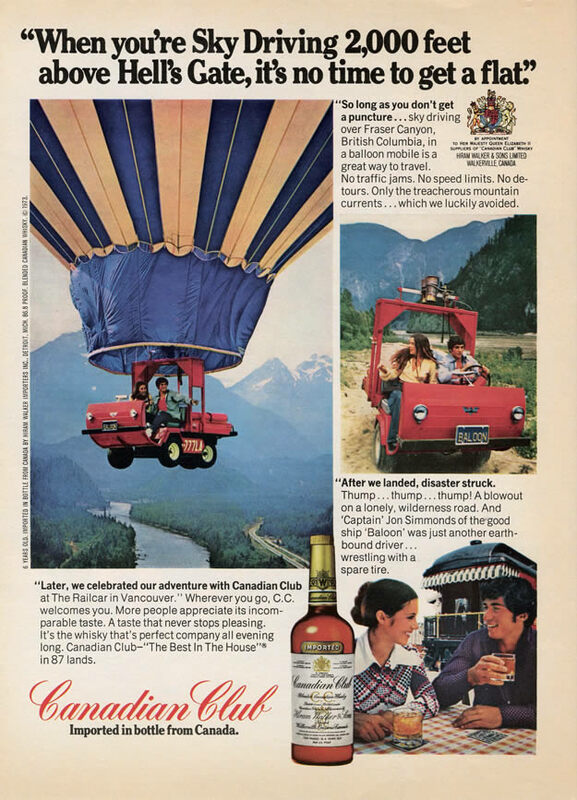 “Later, we celebrated out adventure with Canadian Club at The Railcar in Vancouver.” Wherever you go, C.C. welcomes you. More people appreciate its incomparable taste. A taste that never stops pleasing. It’s the whisky that’s perfect company all evening long. Canadian Club—“The Best In The House” in 87 lands. Imported in bottle from Canada. 6 Years Old. Imported in bottle from Canada by Hiram Walker Importers Inc., Detroit, Mich. 86.8 Proof. Blended Canadian Whisky. This entry was posted in ads of yore and tagged ads, advertisements, advertising, alcohol, alcohol ads, ballooning, canadian club, history, magazine ads, print ads, sky driving, vintage, vintage ads, vintage advertisements, whiskey, whisky on January 18, 2017 by Clayton Hove.